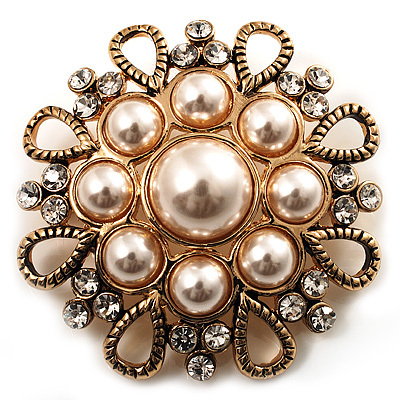 Add a chic finishing touch to your outfit with this glamour Vintage Wedding Pearl Style Crystal Brooch. Featuring a floral design, crafted in burn gold tone metal and decorated with ivory pearl style beads and clear crystals, offering a stunning, sparkling look. It measures about 5.3cm in diameter and fastens with a flag pin and revolver.